If you're unable to access contacts on your iPhone, perhaps because your device has been lost or stolen, or has a broken screen, you may be able to extract them from the iTunes backup of your device. iTunes creates a backup of your iPhone whenever your device is connected to your computer and synced with iTunes. Your contacts will be saved as part of this backup, so that you can restore your iPhone from backup should you need to in the future. iBackup Extractor allows you to view contacts in your iPhone backup and extract them to your computer, ready to copy to your new phone or Outlook. If you don't already have iBackup Extractor installed, download and install it by clicking the link below. To view and retrieve contacts from your iTunes backup, click "Contacts" in the iBackup Extractor category list. Select the contact you would like to extract, and click "Copy as VCard"
With iBackup Extractor, you can view and copy contacts from iTunes backups of any iOS device - your iPhone, iPod Touch or iPad. 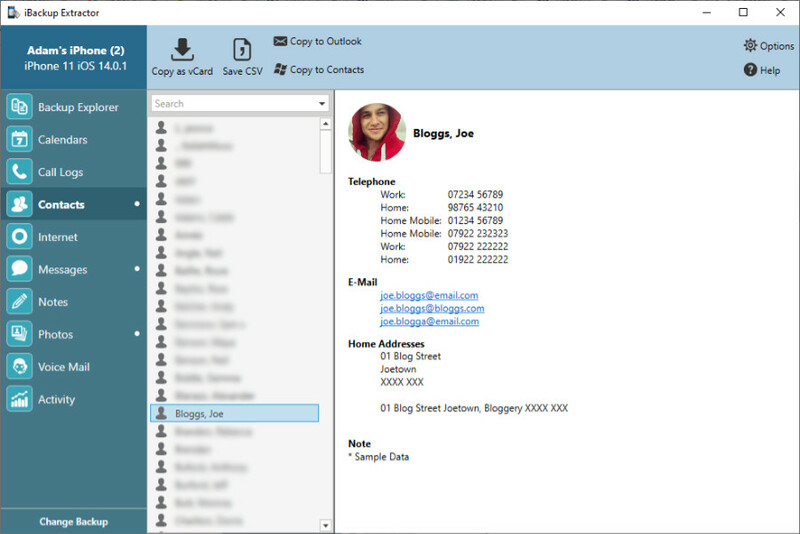 You can even copy contacts to Windows Contacts, Microsoft Outlook (PC), or Address Book (Mac) directly. Continue reading through the guide below to find out how to transfer contacts copied by iBackup Extractor to another iOS device. iBackup Extractor allows you to export your contact information from a backup as vCards, so that you can import and use your contacts in other programs. vCards are files which store contact information about a person or company. These files can be read and used by just about any Address Book or E-Mail program available. For example, vCards can be generated or imported into Windows Address Book, Outlook Express, Yahoo address book etc. To copy your contacts from a backup of your device, select contacts from the list of contacts in iBackup Extractor and click the "Copy as vCard" button. If you'd like to select all of your Contacts, use the Ctrl+A key combination shortcut. Then, simply select the location and folder you want to save your vCards into. With iBackup Extractor you can create a separate Contacts folder to save your contacts to. Once you have copied your contacts as vCards using iBackup Extractor, you can import these vCards to your email or your address book program. To import to Microsoft Outlook, open the folder where iBackup Extractor saved your contacts to and select them all using the Ctrl+A key combination. Finally, you can drag and drop them to Contacts in Outlook. Outlook will open each contact so that you can click on the Save and Close button to save each contact to your Outlook Contacts. Now, to transfer your saved contacts from your computer to your iOS device, you can use the iTunes sync function. To do this, connect your iOS device to your computer, open iTunes and chose your device under DEVICES in iTunes. Click on the Info tab in iTunes and make sure "Sync Contacts" is checked, chose your address book program and click on the "Sync" button. This functionality is only available for Windows 7 and Windows Vista. To copy contacts directly to your Contacts folder in Windows 7 or Windows Vista, select the contacts required and click, "Copy to Windows Contacts". iBackup Extractor will export the selected contacts to your Windows Contacts. To copy contacts to Microsoft Outlook directly, please select the required contacts from the list in iBackup Extractor and click, "Copy to Outlook".